I suppose I’m eating my words at this moment. I know I said I wouldn’t be doing the typical, over-done type silhouette, but once I put it out there, I wasn’t able to get it out of my mind. On the other hand, after looking through my photos this week for other silhouette photos, it seems like “over-done” in my collection would be nature, beach, trees, etc. I’m going to twist that in to saying that doing the classic back-lit figure silhouette isn’t over done…in my case 🙂 Either way, I’m much happier this week in doing photos focused on dark elements as opposed to light elements. I prefer the darker, mysterious, “hidden aspect” type photo to the lighter and transparent one. These shots were a little challenging, but I’m happy with the final results. Getting enough lighting set up when you only have living room/side table lamps to work with was probably the greatest difficulty. You would think in photos where you don’t need to see anything but a blacked out figure as your subject you wouldn’t need that much light, but I was quickly corrected. Happily, we added much more lighting, which gave some nice little details on the figure for some of the images, which I actually enjoy more than the true silhouette images. Editing the photos were a close second in things of difficulties with this shoot. We were both exhausted, and wanted to make quick work of this shoot (though, nothing is ever “quick”, per sey, when working on my projects), so we were a little careless when thinking out what was going on in the background. Having a full backdrop, and being prepared with proper lighting are definitely two things on my list before attempting a shoot like this again, though I would love to give it another try. Thanks to my friend for practically rearranging her whole house to do this, as well as for being my awesome model! I’m happy to say that these photos have a little twist on the assignment of “silhouettes”. Though some are true silhouettes, with the figure completely blacked out, others were completed with more of a touch of “low-key”, wich is something I’ve been wanting to experiment with. Once I get the lighting and set up in order for future shoots, I’ll have to see if I can twist my friend’s arm to do another shoot with me. Until then, enjoy our first collaborative effort of silhouetted figures. From the bright and “fluffy” to the dark and mysterious, this week’s theme is silhouette. Unlike last week, I have a little practice with this one, and I have some ideas brewing already. Since I’ve done quite a few silhouettes in my nature and beach (ok, mostly beach) photography, I think I’m going to attempt to photograph something a little different this week. I’ve always admired those classic silhouettes of a figure standing in front of a window (or some similarly light-flooded set up) in that contrapposto type pose. You know me, though; I might like something, but I’m not a huge fan of doing the overdone. After doing so much reading on high key last week, I also took some time to look into its darker side, low-key, and could see how some low-key images could be interpreted into silhouettes, so I may attempt to incorporate some of those elements in to this week’s challenge. Now, for the true challenge, which is (as usual) finding a model. Maybe I should make “creating a database of willing models” my business challenge for this week, since that’s something I’m in constant need of, yet perpetually without. On a good note, I did find an open studio space for ceramic crafting at the University of Maryland, so I might be able to start working on my prop for the “red” themed week! When my watercolor professor said that the class was going to work on a still life set up and we all needed to bring something in, I started thinking of what could be interesting. She mentioned the importance of the “unexpected”, showed us a few examples, and then said that if we were unable to think of an object, we could always borrow from the classroom still life shelf. Now, when thinking of the unexpected, anything on that shelf doesn’t come to mind. It’s filled with a variety of bottles, bowls, and random objects which would be contained in your typical still life. I thought I would alter one of those objects, and bring in something that was usually expected, but had become unexpected. After venturing over to my parent’s house and practically begging my mother for one of her vases from the plethora which is her collection, I shattered one, and brought it in to class. Everyone brought in your typical items; a bowl, a more stylized vase, some pine cones, flowers and twigs found outside, and of course, some objects from the still life shelf. When I presented my object, I was greeted with shock that I would actually shatter something to make it interesting for a still life. “Broken, for the sake of art! !”, my professor exclaimed. It was pretty comical, in my opinion, but I was happy to contribute something that would make our set up a little more interesting. With that being said, my mother also thought is was pretty, well, dumb for lack of a better word, that I would just break something for my art class. Well, mother, I’m happy to report that my little broken vase is being put to good, multiple, use. When thinking of an idea for this week’s theme, high key, I automatically thought of the white daisies that I bought for a different photo shoot that I did earlier this week, but like I said, I’m not one for the “light and fluffy” type photographs. I began to think of how I could make things more interesting, when alas, I have my little shattered vase, which would compliment the flower quite well, while making for a more complex set up. I’m pretty satisfied with how the photos turned out. They have an element of darkness, while being extremely bright in content. An “I’m sorry gone awry” is what these images make me think of. I know I said I was going to go with the black and white theme, but with being able to actually set up a white backdrop and properly overexpose my images slightly, I thought that leaving those small areas of color would bring in some much-needed variety. Though the original images would have been successfully considered as high key, I did a little editing to remove some of the saturated color in the flower, as well as to remove some of the shadows. I was only working with natural light, so without being able to flood the set up with light, I was bound to have several shadows. Honestly, I like the shadows and light passing through the shattered glass pieces, but to say in line with the theme of this week, I thought I would work to keep my images as close to high key as possible, and eliminate any unnecessary dark areas. Check them out! Well I’m excited to say that one of my outreach efforts for a previous week’s business challenge was successful! Back in February, I started looking around at galleries and shops that featured local artist, and for some juried shows to enter. So I stumbled across the City of Bowie’s page, and found an upcoming exhibit which would be great for the type nature photography I do. The exhibit is Flora and Fauna, and features work centering around the theme of nature, plants, and wildlife. Although I was hesitant and nervous, since this is the first show that I’m entering work in that is not in collaboration with school, I entered the maximum number of photographs (three) hoping that I would at least get one in. To my surprise, all three were accepted! 🙂 So today I dropped off my work, and help set up the gallery/display spaces, also another exciting first. I have to say, it was also a great confidence boost when the ladies coordinating the show strongly encouraged me to up the prices of my work, since they said I was grossly under priced, and would be surprised if the pieces weren’t sold. So here they are, and if you’re in the area, stop by and check them out. They show will be open from now until mid June, so you have plenty of time to see my work, and all the other great work there as well! So it looks like I’m in for another learning experience, or two, with this week’s challenges. For the photography challenge, I have been tasked to take high key photographs. High Key? I wasn’t quite sure what that was, so I googled, and it appears that there are quite a few differences in opinion as to what classifies as high key photography. The general consensus is that a high key photography should contain a lot of white, no/very few shadows, and very lightened mid-tones. Now, when actually viewing photographs, it seems that people have different opinions. After doing some research, the black and white images that I came across seemed to turn out more successful, while the color images were hard to define as “high key” in my opinion, particularly when they contained highly saturated colors. So I think I’m going to go for the black and white look (yay!). The subject matter is going to be interesting, however. Many of the words I found that were used to describe high key photography were “happy”, “bright”, “cheery”, and “light and fluffy”. Ick — I’m not one for doing happy, lovey-dovey, all is well with the world type photographs. I know, I just posted some borderline “fluffy” pictures of flowers, but that’s different! I find beauty in the world, as well as in a lot of things that others would not find beautiful, so when capturing things like flowers and nature, that’s what I’m looking at, not their “fluff” value. The second part of this challenge, the business side, is another bonus photography challenge this week (double yay). The business objective is to shoot the opposite. Now, that’s pretty open for interpretation, but it’s intended to be understood as to shoot the opposite of what you normally do. In evaluating what I usually shoot, I think I have what my “opposite” should be. I’m often doing landscapes, nature photography, and beach photography, and when working on projects, I often work with still life set ups and (usually bribed) models. My opposite would be street photography. It’s something that I’ve always wanted to get in to, have always been intimidated by, and have always adored when viewing the works of others. In just going through the assignments of my photography classes, I was always in awe of how these non-art-marjor, amateur photographers, would capture wonderful, candid images in their street photography. Not that I’m looking down on their skill in saying that, I’m actually giving them props — they were brand new in a medium I have worked with for years, and seemed to have broken through the barrier that the idea street photography has built for me. As I worked through my classes and became more familiar with the works of other artist, I became even more captivated with the idea of capturing striking photos from everyday interactions. I would have to say that my favorite would be Garry Winogrand, which was only amplified after I saw an exhibit of his at the National Gallery. I’m a little bittered of the idea of street photography after seeing his photographs, wishing that people still dressed the way they did in the 50’s and 60’s. I feel that there is a level of class in that era which he captured in his images, and nothing close to that could be captured again. If you haven’t seen his work, you should, like right now — it’s pretty great. Anyways, as I ramble on, that’s going to be my focus for the weekend, hopefully. With another bout of winter weather coming around, I may have a better chance at catching some outdoor high key photographs than street photography. Wish me luck! Oh, and here’s a couple of photographs which I have taken in the past that bordered high key, and with my edits, I think are approaching that technique. Not quite sure if I’ve got it, but hopefully with some intentional lighting and camera settings, I’ll catch the light just right. Well, technically, it will be tomorrow. Really, this weather couldn’t be more appropriate for describing my feelings in waiting for warmer weather. One day it’s beautiful and Spring is right on the horizon, and the next, it’s snowing….like how Friday is supposedly going to be. Just yesterday it was 60 degrees! I’m on a roller-coaster ride with as many peeks and valleys as highs and lows in the forecast. It was wonderful going outside with just a t-shirt and jeans, but it looks like Mother Nature will have me bundling up a few more times before she truly lets it warm up. So I know I mentioned that I may be doing something sentimental for the collage project this week, but I suppose I did something more along the lines of sentimental-ish. 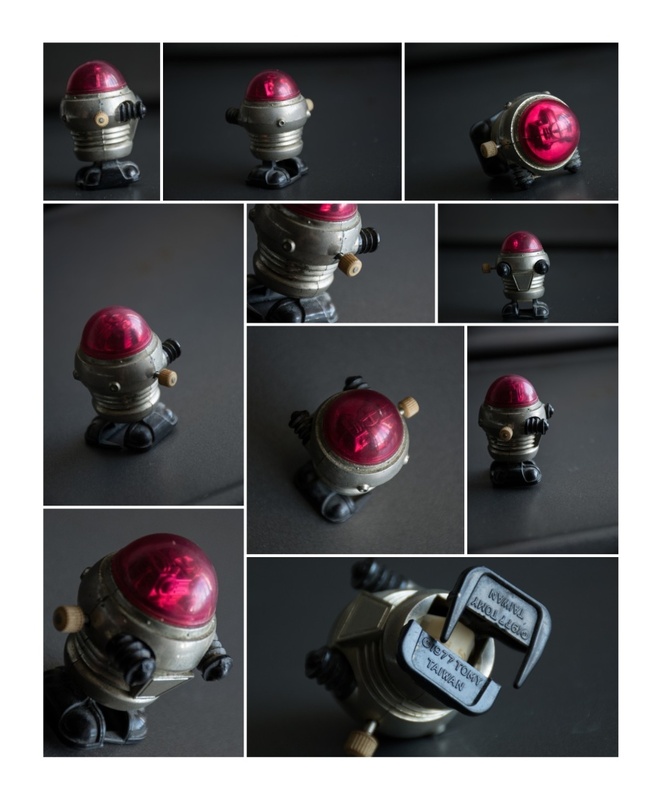 I chose my cute little robot to take pictures of 🙂 Let me give you the back story….even though I don’t have the complete story myself. I’m pretty sure that this used to belong to either my mom or my aunt, though I could be totally wrong, I know it had to have belonged to someone else before I got it. Regardless, I can remember this little robot from when I was really little, so in my mind, it’s like the first toy I ever got. Though I know that’s not true also, it’s the definitely the oldest one that I still have, and one of the earliest memories from my childhood. It doesn’t hurt that he’s super cute, too. So here’s a playful little collage of my dear little robot, that I’ve had forever, and who has survived many a move and managed to remain in one piece, and still work! I had fun creating this homage to my little robot friend. Wish I could have gotten closer with the details, but I guess he’ll just have to hang in there until I can get a macro lens, or until I figure out some other creative way to magnify things. And a big thanks to collage.com for making things easy for me — if you’re ever looking to make a quick collage, that’s the way to go, especially since some of the other, more well-known sites that I tried, didn’t work/were a pain.